Coinciding with Colombia's 200th anniversary as a republic, the world's most bird-rich nation finally has a new field guide. 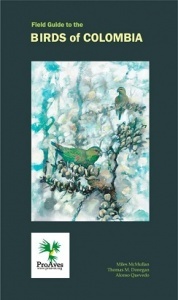 It brings together original illustrations of all the country's birds, including most plumage variations, many new and even undescribed species, original text and up-to-date maps. Never before have so many species been described and illustrated for a national field guide. The guide features all-new texts, maps and illustrations for all of the birds recorded in Colombia, including offshore islands. Every species is illustrated and all of the non-pelagic species are mapped. Plates are arranged to show illustrations, maps, text, field notes and notes on endemism and threat status side by side in a single information cell. Emphasis is placed on features that will be most useful in the field. The book is more field-friendly than most other national guides for neotropical countries. At 250 pages long and just 12.5 x 21 cm, it is the first genuinely pocket-sized comprehensive field-guide for one of the biggest neotropical avifaunas. All profits from this book will go toward the pioneering conservation work and unrivalled network of protected areas of ProAves in Colombia.